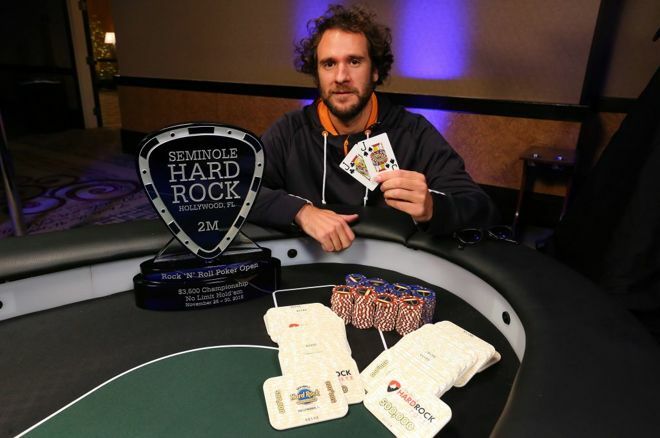 Patrick Mahoney won Rock 'N Roll Poker Open at Seminole Hard Rock for $564,227 in a field over 700. Seminole Hard Rock capped off their Rock 'N Roll Poker Open with a $3,500 Main Event that carried a hefty $2 million guarantee. The tournament met expectations with 760 entries and a $2,432,000 prize pool, and when it was all over, Minnesotan Patrick Mahoney was the last player standing. He pocketed $564,227, the biggest cash in a poker career that had already seen him earn over $700,000 in tournament play. Some of the players among the 72 to make the money who did not advance to the final table were Will Failla, John Racener, Matt Glantz, Matt Berkey, Jason and Natasha Mercier, Mukul Pahuja, Johanssy Joseph, Jake Bazeley, Keven Stammen, Chino Rheem and Ben Keeline. The latter, who claimed a bracelet in Colossus II this summer, was eliminated in 10th place after running nines into Ari Engel's aces and getting the last of his chips in with against kings. Upeshka De Silva, another bracelet winner, was the man to catch for the majority of the penultimate day but he handed his lead over to Matthew Humphrey in a couple of big pots just before Keeline busted, according to the live updates. Engel was looking to take a second big win in 2016 after shipping Aussie Millions in January, but he went out courtesy of a bad beat when his jacks were cracked by De Silva's . After John Spadavecchia Jr. and Matthew Zarcadoolas followed him to the rail, the remaining players bagged for a final day that would see them playing in front of Poker Night in America cameras. De Silva retook the lead early in the final day when he flopped quads against Humphrey. The start-of-day leader lost another big pot when he semi-bluff jammed a royal flush draw on the turn against Mahoney only to have Mahoney show kings full. De Silva raced back out ahead of the field, though, and he had about half of the chips five-handed with over 70 big blinds after Bill Jennings busted in sixth. Mark Dube got in ace-five against the ace-seven of Billy Pilossoph but couldn't muster so much as a chop as both players paired their kickers to leave Dube busted in fifth. Pilossoph then jammed ace-ten over a De Silva raise only to have Humphrey wake up with kings in the blinds to take nearly all of his chips, leading to another elimination. A big moment arrived for Mahoney in a blind battle with De Silva. He completed the blind, called a raise and then called two streets before checking a completed board of . De Silva moved all in for a little less than pot holding and got snapped off by Mahoney, who hit a flush on the river with after turning two pair. That gave Mahoney a 2-1 lead going heads up with Humphrey. Just half an hour in, a monster flip went down with Mahoney holding jacks and Humphrey . The board ran out dead for both players, leaving the jacks best and Humphrey had to settle for second and over $300,000.